No performer on the world stage received so much acclaim and publicity as Rudolf Nureyev, and no one gave away so little about their private life and thinking. 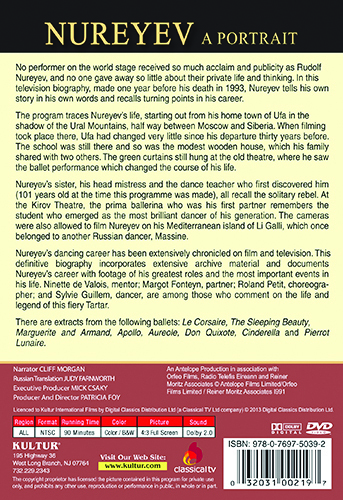 In this television biography, made one year before his death in 1993, Nureyev tells his own story in his own words and recalls turning points in his career. The program traces Nureyev’s life, starting out from his home town of Ufa in the shadow of the Ural Mountains, half way between Moscow and Siberia. When filming took place there, Ufa had changed very little since his departure thirty years before. The school was still there and so was the modest wooden house, which his family shared with two others. The green curtains still hung at the old theatre, where he saw the ballet performance which changed the course of his life. Nureyev’s sister, his head mistress and the dance teacher who first discovered him (101 years old at the time this program was made), all recall the solitary rebel. At the Kirov Theatre, the prima ballerina who was his first partner remembers the student who emerged as the most brilliant dancer of his generation. The cameras were also allowed to film Nureyev on his Mediterranean island of Li Galli, which once belonged to another Russian dancer, Massine. Nureyev’s dancing career has been extensively chronicled on film and television. 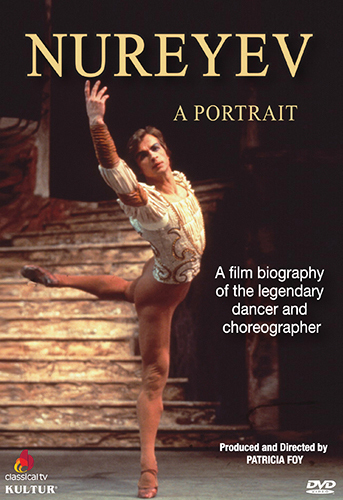 This definitive biography incorporates extensive archive material and documents Nureyev’s career with footage of his greatest roles and the most important events in his life. Ninette de Valois, mentor; Margot Fonteyn, partner; Roland Petit, choreographer; and Sylvie Guillem, dancer, are among those who comment on the life and legend of this fiery Tartar. There are extracts from the following ballets: Le Corsaire, The Sleeping Beauty, Marguerite and Armand, Apollo, Aureole, Don Quixote, Cinderella and Pierrot Lunaire.